Irish football fan Zino Kelly responded to an article in today’s Times Ireland edition which claimed some football fans are planning to hold a protest at the Ireland V Georgia match in the Aviva Stadium in Dublin tomorrow night. The report said the protest will involve people throwing tennis balls onto the pitch. But Mr Kelly claimed the allegation that people planned to throw tennis balls was from the “FAI propaganda machine”. “It [the protest] will be interesting to see but it will definitely not tennis balls. Tennis balls, you know that’s trouble. 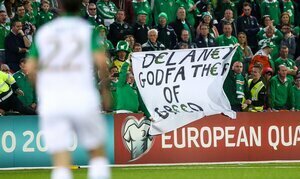 I’d say you’d have to get on to the communications’ officer in the FAI to find out why, why that’s made the papers. “For the last five years they’ve [FAI] been heavy handed – especially in the South Stand of Lansdowne Road and I think this is an excuse, when all the limelight is going to be on them tomorrow night. Mr Duffy pointed out bags are normally checked at games as a matter of security. “They are indeed. But it’s a bit different when you go down to the singing section on the South Stand and there is, you know, there’s heavy searches and if you compare that to if you’re going to the West Stand and East Stand, there’s no searches. “And this all stemmed from a protest 2014, when we were playing against the USA. 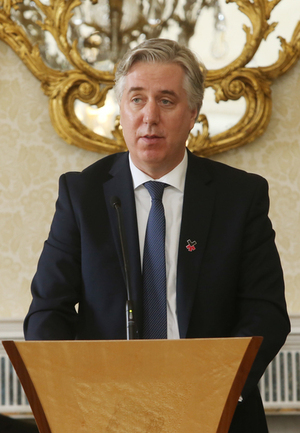 Mr Kelly also said he won’t return to watching Ireland play a home game, until John Delaney leaves the FAI “and indeed the whole board”. Posted in Misc and tagged FAI, John Delaney, Lansdown Road at 2:24 pm on March 25, 2019 by Bodger. Can we not just wish John well on his first day in his new job? Reg : Judean Peoples Front. We’re the Peoples Front of Judea…..
No need for bags. Just put them down the front of your trousers and see if you get searched. Love the Euro symbols. Double edged meaning. Does Brexit mean the Brits (England, Norn Iron, Scotland, the boring bit to the west) can’t complete in the Euros? This has a sinister feel to it. It was Ciaran Kennedy who claimed in the Times Ireland today “In protest, some fans are planning to throw tennis balls on to the Aviva Stadium pitch to disrupt the game against Georgia” but there’s no source or grounds given for that statement. It is a strange thing to report, because it would precipitate delays at the match and crowd trouble. Is the Liveline caller right that it’s the “FAI propaganda machine”? Before writing it off as paranoia, poor Noel Rock TD said in the Sindo yesterday that the FAI was briefing against him after he called for Delaney to step down last week. Noel believes the FAI said he was only angling for free tickets.